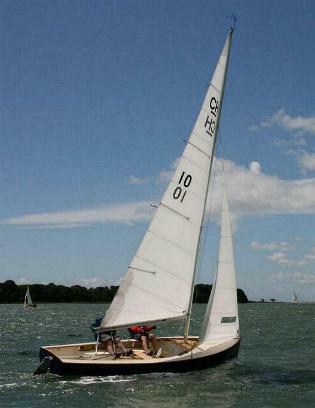 The NEW 'Chichester Harbour18, developed from a design in the 1930's called the 'Chichester Harbour Restricted 18 foot Class'. The Chichester Harbour 18 has a carval effect (smooth) GRP hull with simple wooden trim (for easy maintainance). It has grp sheathed centreplate/rudder blade and aluminium spars, and retains the classic look of the 1930's version. We have modified the design since our first GRP version of the Chichester Harbour 18 built in 1998. The boat now has slightly more sheer and a completely new GRP cockpit. This boat can be used for club racing and fast day cruising. This new version is self draining, when on a mooring and can be supplied with either optional bare teak or varnished mahogany woodwork. To view photos of the new boat please go to the CH18 gallery. The boat pictured has some optional extras supplied by us: duel control lines lead aft, All teak woodwork, boottop line, coppercoat antifouling, trailer and cover.